Most people think Goa is just to chill out on beaches, with nothing much to do. Well, actually Goa is a great place to do a lot of shopping also only you need to know what to shop in Goa. 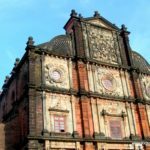 We have been to Goa many times and every time we discover a new aspect of Goa, most people do not realize that Goa is not a city it is a state with many facets and so you can find a lot of things to shop in Goa. Feni or Cashew Feni: Feni is country liquor almost synonyms with Goa and best Goa Feni is made from cashews apple, though and there is also a Feni made from coconut. Feni is the unofficial state drink of Goa, a bottle of Feni will cost you around 100 Rs and if you want to buy some drink for your bewday ( बेवड़े = Drunkard) friend then buy some bottles of Feni. Port Wine: Port wine came to Goa with the Portuguese when they started local production of wine, the Portuguese left but wine remained along with other signs of Portuguese culture. Most of the port wines are sweet and fairly cheap. The challenge is now with good wineries coming in Goa, the Portuguese are a worried lot and want to apply geographical restrictions on calling wines produced in Goa as Port wines. ( Warning from desi Traveler: Big B said in his super hit movie “ Satte Pe Satta”… daroo peene say liver kharab ho jata hai… (Translation: Drinking alcohol leads to a spoiled liver -the one in your body not Johnny Lever’s Liver). Spices: Yes you read it right Kerala is not the only place to get spices, Goa is also on the Malabar Cost of India and grows all kind of spices. Only they never branded themselves as spice country, being happy with labeled only as beach country. So you can visit some of the spice farms who offer guided tours and sell spices grown in Goa. The icing on the cake is that they are fresh and a little cheaper than what you get elsewhere. So take your pick from Cardamom, Cinnamon, Black Pepper, Cloves and a host of other aromatic spices which launched a thousand ships from Europe to discover a sea route to India, to break the monopoly of Arab traders on the spice trade. Cashews: Buy as much as you can carry, for the best cashew in the country is found in Goa. You will get them in all flavors, spicy, salty, colored, coated with chick flour etc. Trivia: The trees were imported from South America to prevent soil erosion. Sorry to break your heart if you thought Cashew is as Indian as Aloo, (potato) which also, by the way, is also South American. Ok, now let us go and buy some sea shells in Goa. My personal favorite is small show pieces made of sea shells. 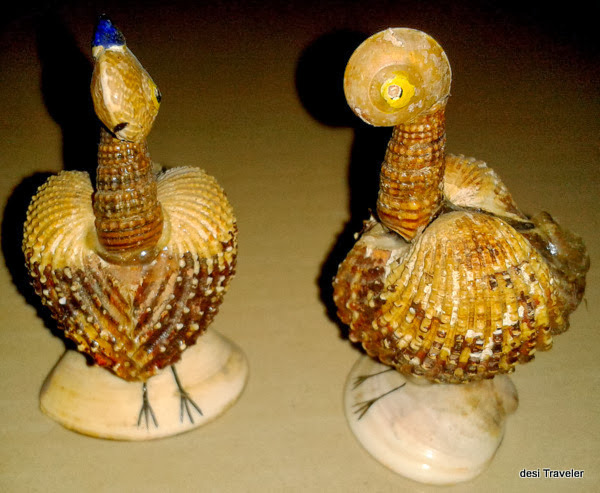 Check these birds made from different sea shells and the big Shells that we bought from Calangute beach shacks. The 5 Rs coin on one of the shells will give you an idea how big the shells are. Initially, I was worried that buying sea shells may have an adverse impact on the environment, but I was assured by the shopkeeper that these shells wash to the shore on their own with tiles and are collected by fishermen. So I guess they are OK, but if you think otherwise please let me know. 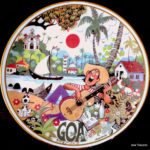 Painted Tiles: Confession: This post was actually written to highlight the painted tiles from Goa. The idea came when I stumbled on Mario Miranda cartoons stall at Comic Con. 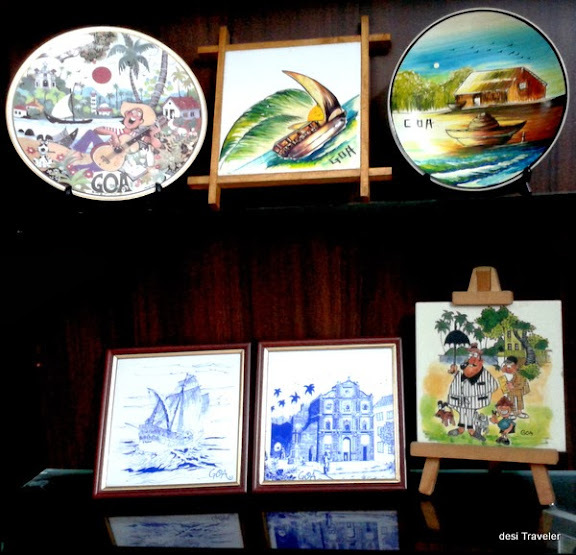 The painted tiles are my favorite item to shop in Goa. For 2 reasons one, you get some really beautiful blue tiles whose process also came to India with the Portuguese. 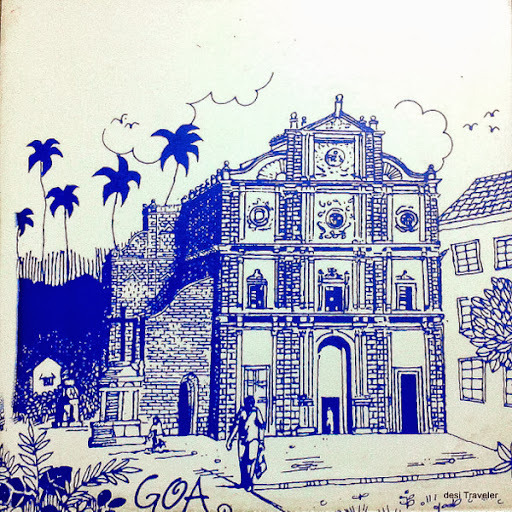 Today you can find these blue tiles with pictures and sketches about Goa like this Picture of St. Xavier’s’ Church in Old Goa or the Portuguese ship battling the rough waters of Arabian Sea. 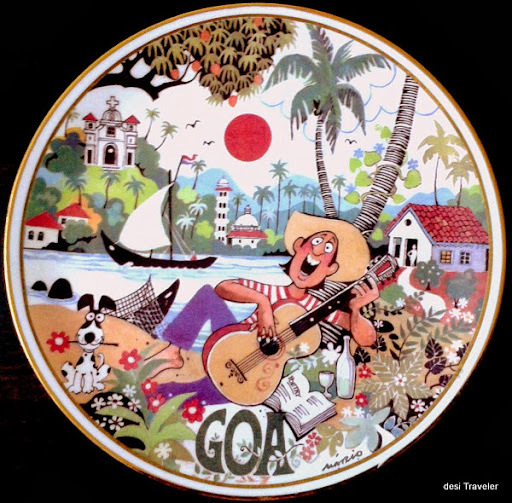 The other reason I like these tiles is cartoons by Mario Miranda who has captured life in Goa to the minutest detail and garnishing of humor. So we have a small showcase full with these beautiful tiles from Goa, and to be honest that is my own personal corner of our house. 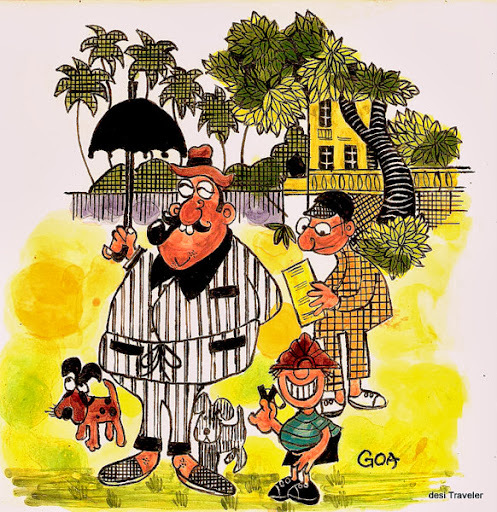 Whenever I miss Goa I look at these cartoons from Mario Miranda and I am teleported in the land of Sun, sand, and beaches ( add spices, cashews, and wines to that). You can buy tiles with Mario Miranda cartoons online also from Mario Miranda site. Buy Some Property: Boy this one is a biggy. As Goa is one of my favorite places in world hopefully one day I will be able to retire there in a beachside Villa. 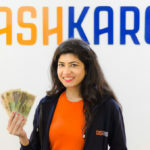 Till then if you are loaded, go ahead buy some property there and if you are too busy to move there permanently and need a caretaker, you can use the contact me form to get in touch with me. 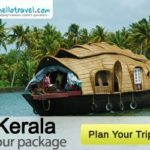 As a reader of desi Traveler blog, you will get a good discount if you hire me as a caretaker of your beach villa in Goa. If you know the email of Mr.Mallaya please send this post to him you never know he may be looking for a good caretaker for his Kingfisher Villa in Goa. Where to Shop in Goa: You are actually spoiled for choice, from the shacks on beaches like Calangute, Vega, Vagator etc, most hotels also peddle handicrafts, cashew, and wines. The rule of thumb is simple ” Those who bargain, get a bargain”. So I will not suggest any one place, hey part of the joy is discovering things, and Goa is perfect for that. 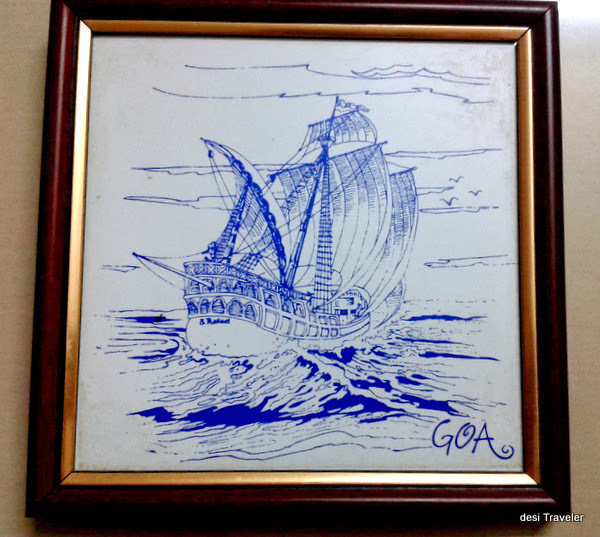 I hope you have liked this post in the Goa Travel Blog series. Do check my other blog posts about Goa. Note: All pictures taken by My Cell phone. Well depends if you are looking for some peaceful time or shopping. 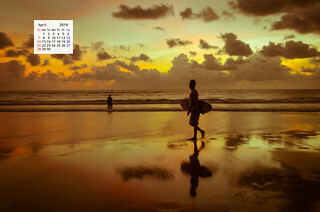 Calangute in my opinion is more crowded and popular with the backpacker crowd. That’s a great post. Definitely the things to bring back from Goa. I just remembered I had one of those painted blue and white tiles, back home. Picked it up for my then fiance (now hubby) when I was in Goa on a reporting assignment. :). On my very first trip to Goa, I remember picking up a mutli-layered dessert. I forget the name but my family was impressed by the very-Goan delicacy. Wow! That is quite a comprehensive guide to shopping in Goa. I love those shells, so artistic and pretty. And, of course, I love the tiles too, you have got a pretty good collection in your showcase there – so very eye-catching and beautiful. 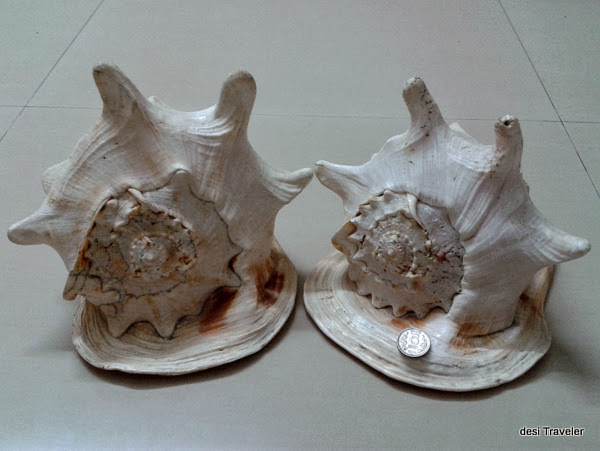 Thanks Arti.. we have collected these over a few years as Goa is one place we want to go again and again for holidays as well as for some shopping too..
Wow, really useful. Was aware of the cashews and wine deal, but not about spices and tiles. Another great buy for fish and meat eaters are the various pickles. Goan sausages too are a treat, and they keep for weeks, if not months if refrigerated, since they are as good as pickled with spices. Enjoyed the information, especially the tip about the chilis in the comments. Hmm buying a property was a novel one! May I add some more information?. Another spice to buy in Goa is Chillies. Those small ones which are colorful, but not too hot. Those Portuguese chillies which are hot.. spicy.. and expensive. 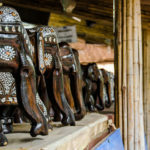 And to shop… The Madgoan Market and Mapusa market are also good places to shop. Hey, You are doing a great work here. I must say you’ve done a wonderful job by sharing your article with us. It took more time for me to read it fully, But it’s worth it Really.